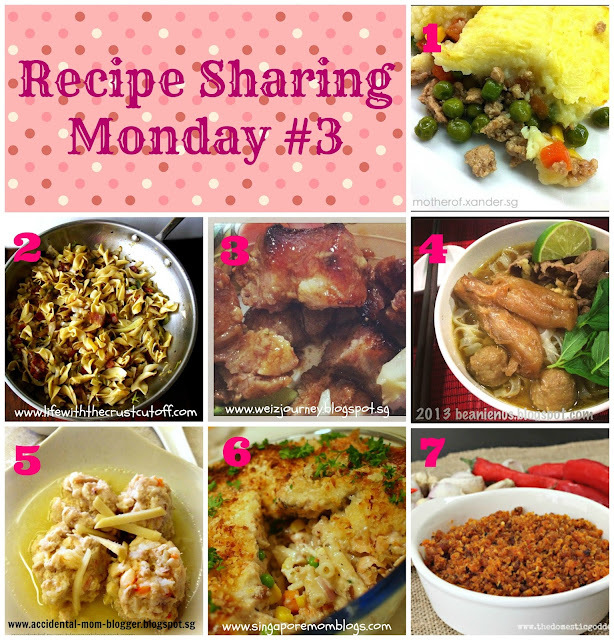 Recipe Sharing Monday #3 is a week's late. The days just zipped by without me noticing. Besides that I have not been cooking much these couple of months due to a hectic work schedule plus some Saturdays we are over at DinoUncle#1's house for dinner returning home late thus making Sundays a laze around day for me. On top of that I found a new love; a love for baking~ I don't know how some of you can bake AND cook on the same day, I am all drained out just by baking alone! Perhaps I should find a way to manage my kitchen task to accommodate both then we will have home cook meals and deserts. There are many great recipes in the last 5 Foodie Fridays linky, there is even one that shows us how to make ricotta cheese from scratch! Please keep those recipes coming~ I'm sure many of us will benefit from it. Without further ado, here are some of the wonderful recipes which I hope will make you want to try to cook for your family. I especially like #6 & #7, how about you? 4. Vietnamese Beef Pho! by Beanie N Us! Thanks for sharing my recipe again! Muack!